Judging by the fare at Hell’s Kitchen, I would ascertain that the devil isn’t really a fussy guy, but appreciates small touches and good quality. Apparently, he likes to fill a large hole in his emotional well-being with comfort food. The Anoka-Hennepin School District agreed to settle the case of a high school junior who allegedly was harassed by two teachers because of his perceived sexual orientation. According to a Minnesota Department of Human Rights investigation, two teachers repeatedly made antigay comments about the student in front of classmates. The department stated that teacher Diane Cleveland told a class the boy’s “fence swings both ways.” Another teacher, Walter Filson, allegedly told students the boy “enjoys wearing women’s clothes.” The school district denied it violated Minnesota’s Human Rights Act, but has agreed to pay the boy’s family $25,000. Hi, I’m Kevin with the STYLEDLIFE® and styledlook® team. Yes, summer is winding down and thoughts will be turning soon to autumn romance, Vikings football and of course fall fashion. I can’t help too much on the romance and football front, but I know that STYLEDLIFE and styledlook can make your fall look modern and cool. What is the new fashion equation, you ask? It’s our vision and belief that looking modern and fashionable has nothing to do with status, money and/or buying all new clothes. We believe it’s a mix of taking what you have, mixing in accessories, honoring and developing your personal style and “owning your look.” Whether that look is always casual, always dressy or like most of us a blend of casual elegance, we strongly believe in being yourself. Granted, we don’t really believe that anyone starts out with “no style”…but after twenty+ years in the fashion industry, I do know how challenged the average person feels about their personal style and wardrobe. Many of you know that STYLEDLIFE is an accessory shopper’s nirvana specializing in modern fashion accessories for men & women. I don’t want this to be just a plug for our company….because quite frankly, there are mass merchant stores that have cool accessories too. We just want each of you to understand that adding one simple accessory, be it a long necklace, pair of cufflinks and/or a fresh new messenger bag can ramp up your new fall look. 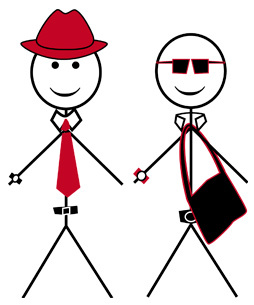 Our happy “STYLED YOU” stick figures, Alex & Paul, represent the confident, polished dudes who utilize accessories to make their own unique style statements! 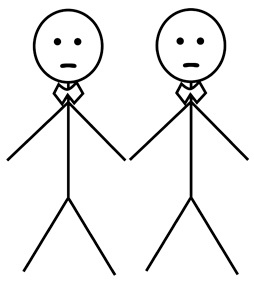 Oh, and of course, happily replace Alex & Paul with Alice and Patty and you’re good to go too! We will start a new round of “On the Runway” starting in September. Thank you very much for partaking in our column this past year and don’t hesitate to let us know what you’d like more of, less of, etc. This column is for you, loyal Lavender readers. And don’t forget, STYLEDLIFE’s last Sale of the year is going on now until September 6. With discounts of 30-70% off, now is the perfect time to start focusing on your fall fashion look! Isn’t Fashion Fun is your monthly go-to resource for tips, suggestions, and fashion expertise on how style-related material plays into your wardrobe and vis-à-vis your busy life. Isn’t Fashion Fun is brought to you by fashion leader STYLEDLIFE® and the wardrobe experts® team at styledlook®, the premier at-home wardrobe consulting company with clients nationwide. Got a big event or hot date coming up, and don’t know what to wear? No worries—we’re here for you. What’s the best accessory gift or music CD for a particular recipient? Yes, we can dial you in on that, too. E-mail all of your fashion questions and/or wardrobe dilemmas to info@wardrobeexperts.com. You deserve to look your best, feel your best, and strut your stuff looking dynamite! Isn’t fashion fun.